Description: Low shrubs 2 to 3 feet in height with extremely soft, triangular leaves that are light green on top and silvery white underneath. Their soft texture is due to the tiny hairs that cover the leaves. These hairs reflect sunlight away from the plant, reducing the amount of water lost through transpiration. Honohono also sends out a beautiful spike of sweet-smelling flowers, each one up to 18 inches long and covered with white flowers of about 2 inches in length. They smell as sweet as they look. Honohono has soft textured leaves with lovely blossoms that emerge from 18-inch spikes. 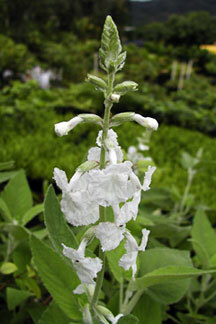 Distribution: This is a rare plant in the mint family, formerly found on Kauai, Maui and Hawaii. The only known wild population is in Kipukakalawamauna on the Big Island. First recorded during the time of Capt. Cook, the plant was rare even then, possibly because there are no known cultural uses. Landscape use and care: This plant is an excellent addition to any garden and is a must-have for native and rare-plant collectors. It requires little watering and does best in full sun. Few pests bother it, although if left in a wet location, it will develop small spots of white mold. If you notice this, simply move it to a different location or reduce its watering schedule. Also: This is one of Hawaii's many native mintless mints. The flavor of mint within the leaves was a natural defense against grazing predators such as deer and goats. But because these plants evolved in Hawaii with no such predators, the mint defense stayed dormant and was eventually lost. In its place the plants developed large, beautiful, sweet-smelling flowers.